Dubbed as “Super Dozer,” the Komatsu D575 is a 1,150 horsepower (860 kW) tractor crawler. It can be used as a ripper/bulldozer or as dedicated bulldozer with a standard blade, making it capable of moving 90 cubic yards of material per pass. With an optional blade, it can move 125 cubic yards of earth. Surface mine operators were the first users of the Super Dozer but now it can also be seen in heavy constructions. 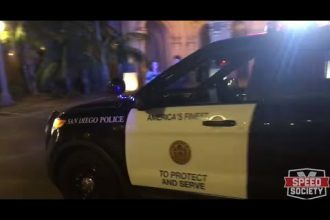 Cop Plays The Pokemon Theme Song Through Balboa Park! WTF? !